Welcome to the Third volume of The Ultimate Apple Desserts Cookbook – The Delicious Apple Desserts and Apple Recipes Collection!! Are you looking for Recipes for The Perfect Apple Cake? This cookbook has a little bit of everything when it comes to apple cake recipes. Whether you are looking for a traditional apple cake, a seasonal apple cake recipe or a more unique apple cake recipe, this is the perfect cookbook for you! Enjoy the delicious taste of apples in a variety of Apple Cake recipes today! The type of recipes you will find inside 50 Delicious Apple Cake Recipes – Delicious Apple Cakes To Make And Share are tasty apple cake recipes to make for Sunday dinners, holidays, parties or just because! We hope you enjoy them all! 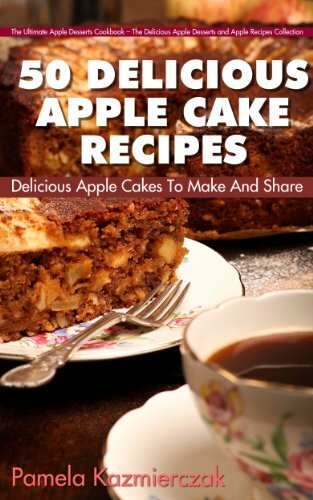 What Type apple cake recipes are in this book? Now that you know more about this book and why it is for you do not forget to scroll up the page and click on the buy button above so you can start enjoying apple cake recipes right now!